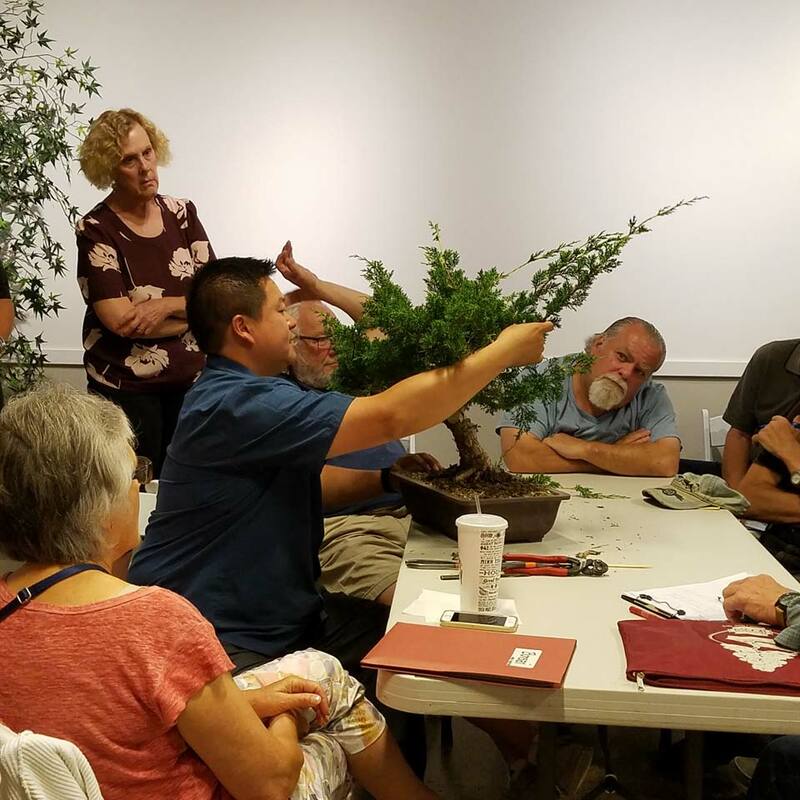 Our August session with Peter Tea focused on three different junipers. 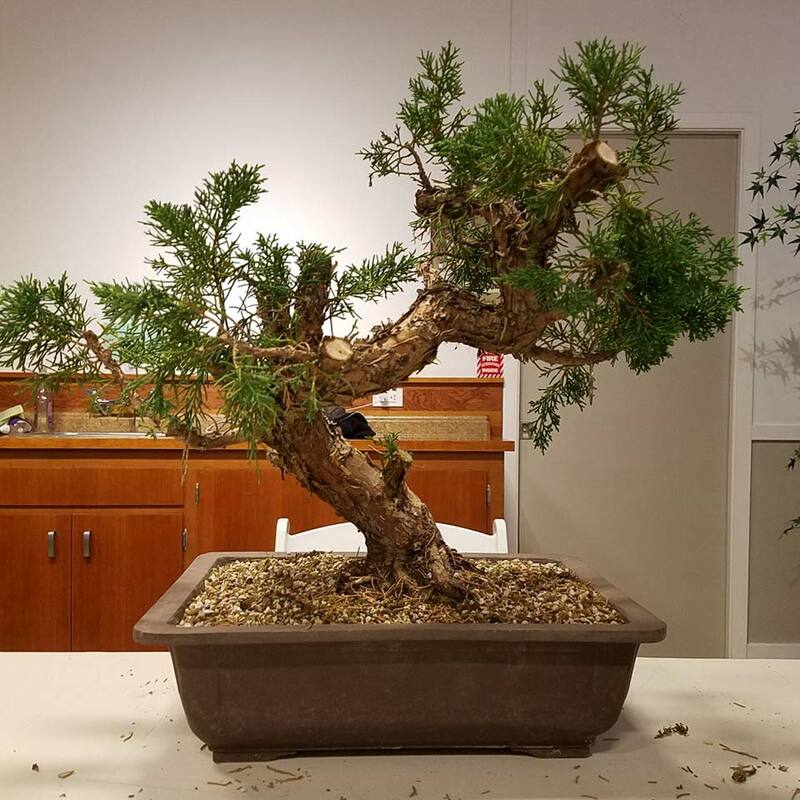 He brought a Sierra juniper trunk with lots of successful Shimpaku grafts, a Kishu, and an Itoigawa. He also brought some type of cypress as an example of a well-developed tree. The ramification on the undersides of the many dense pads on the cypress were a wonder to behold. Before proceeding, I would like to share the results of a little online research I did into the names of the junipers Peter brought. 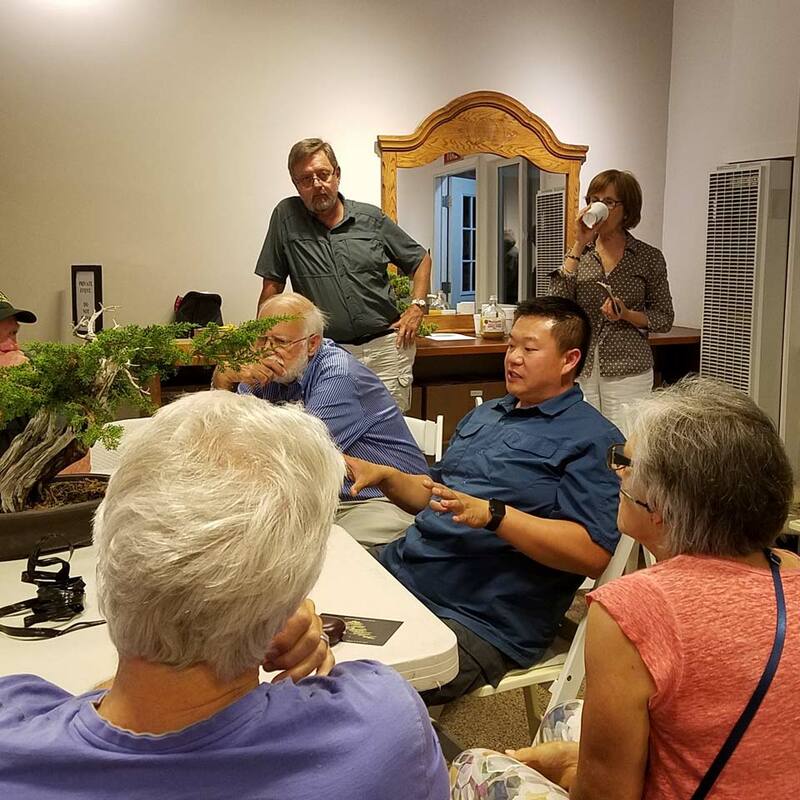 Peter kept referring to his “Kishu” with a quick, parenthetic reference to “Shimpaku,” the name I recognize for the smoother, more luscious-looking variety of juniper. I was unclear if Peter using both names meant they are interchangeable or something else, and I suspect I wasn’t the only one. 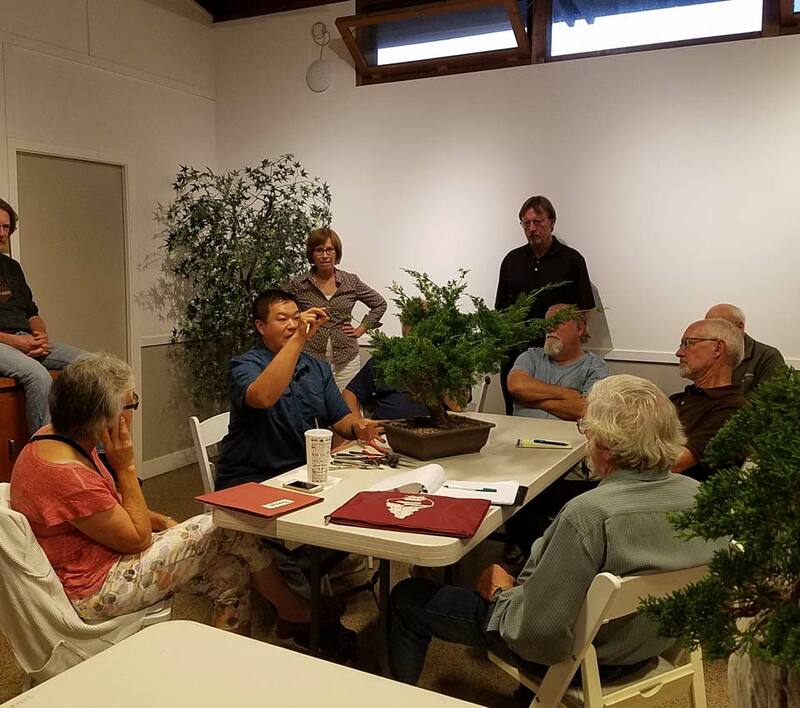 Apparently, Kishu, Itoigawa, and Shimpaku are all distinct but similar varieties, equally valued for their smooth, scale-type foliage, which is universally considered superior to the needle-type foliage found to differing degrees on other juniper varieties. As he prepared to start work on the first tree, Peter reviewed the list of signs you want to see from a tree before you start any major work on it. These are bushiness, runner branches, and foliage that has hardened off. 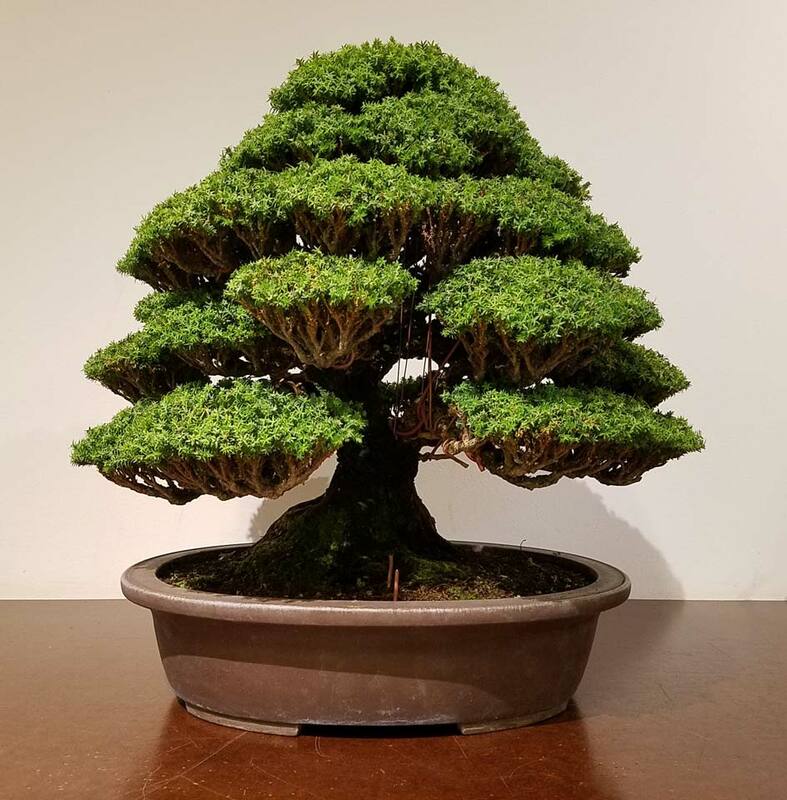 He pointed out that with relatively slow-growing varieties like Shimpaku, you may only get these signs of vigor once a year while developing a tree. The more common varieties, like procumbens nana, grow more quickly and might bounce back from your pruning as many as three times a year. The particular growing conditions will also have an effect on how often a tree can receive major stylistic changes. The first tree Peter started working on was the Kishu, which had lots of runners. His work focused on chopping back lots of the top to redirect energy to the bottom of the tree, where back-budding was needed. 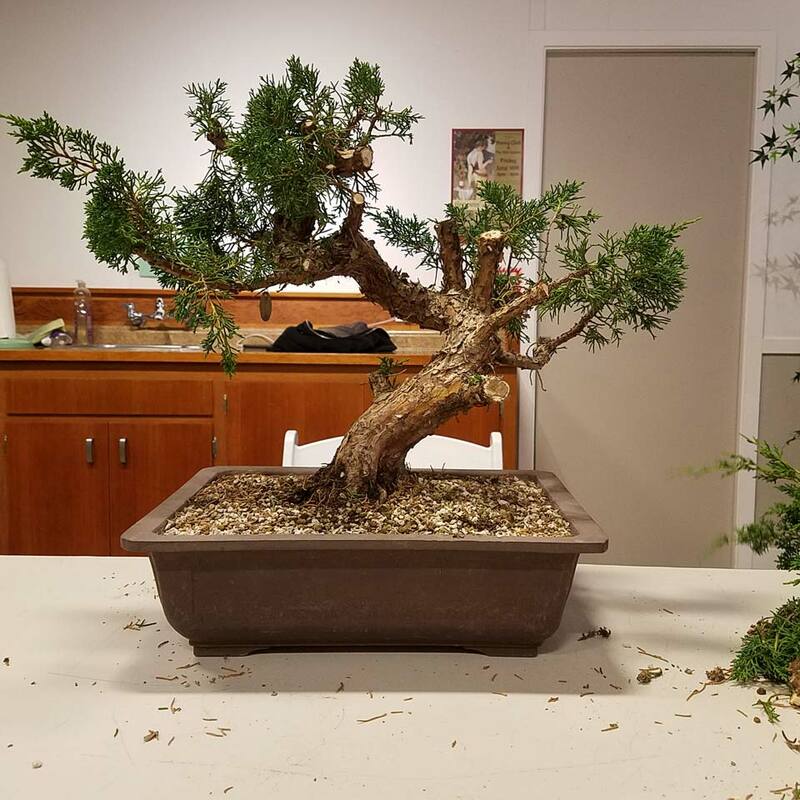 A couple of general tips Peter gave as he sized up the Kishu: Back branches on all trees tend to be longer than the front branches, so that you can see them back there. Most of us learn early on how important it is to work in all three dimensions so you don’t have flat trees, but having long back branches is about more than that. It’s about creating depth by drawing upon the visual contrast of fore- and background elements. 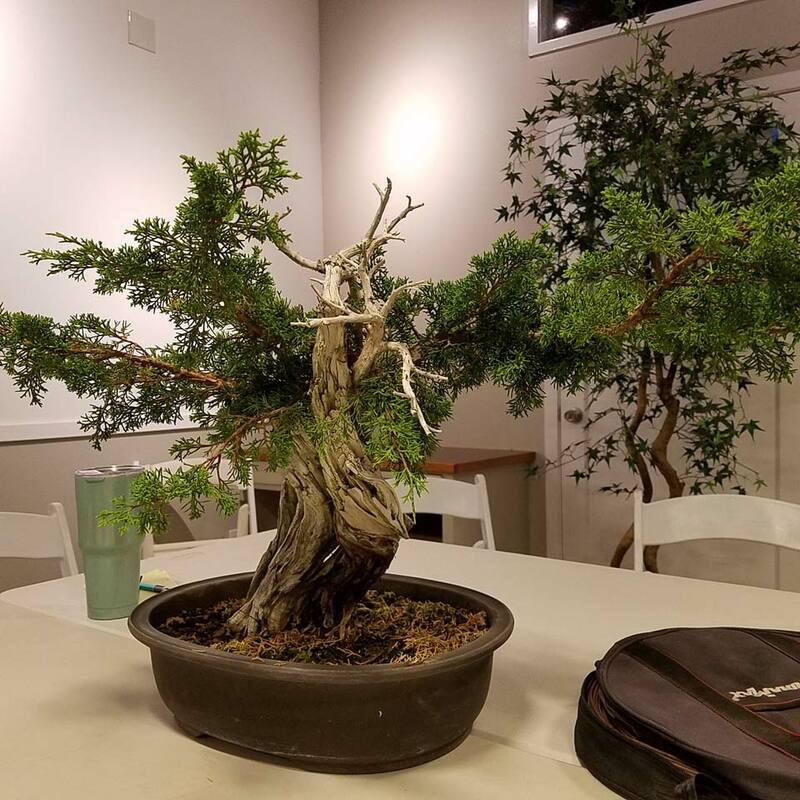 Another great tip that came up as Peter considered the deadwood on the Kishu: To keep deadwood that touches the soil from rotting, use a drier soil mix in that area, typically accomplished with high levels of pumice. I will definitely be using that tip on a tree of mine that gets a little funky in the winter where bare wood touches soil. 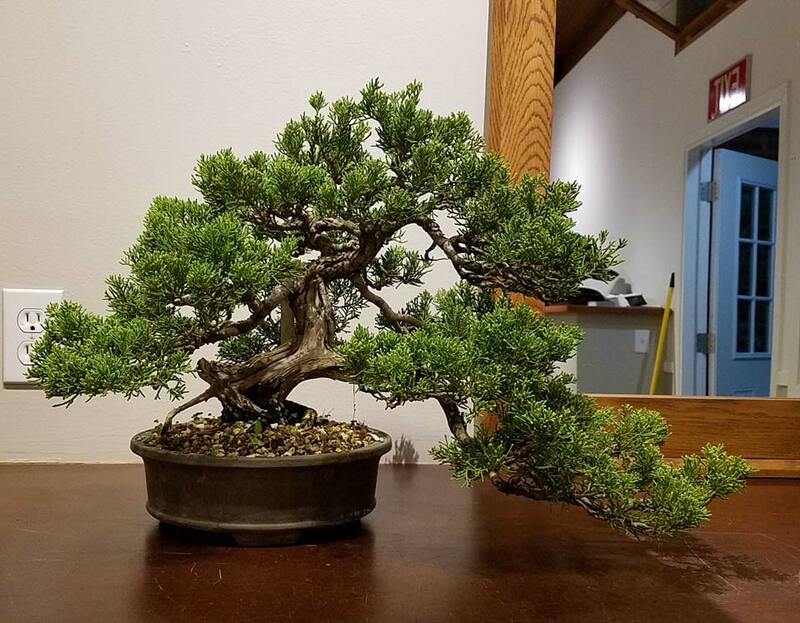 To round out the night, Peter turned his attention to the Itoigawa juniper. He suspects that this tree has been grafted in the past. It probably has Sierra juniper roots. 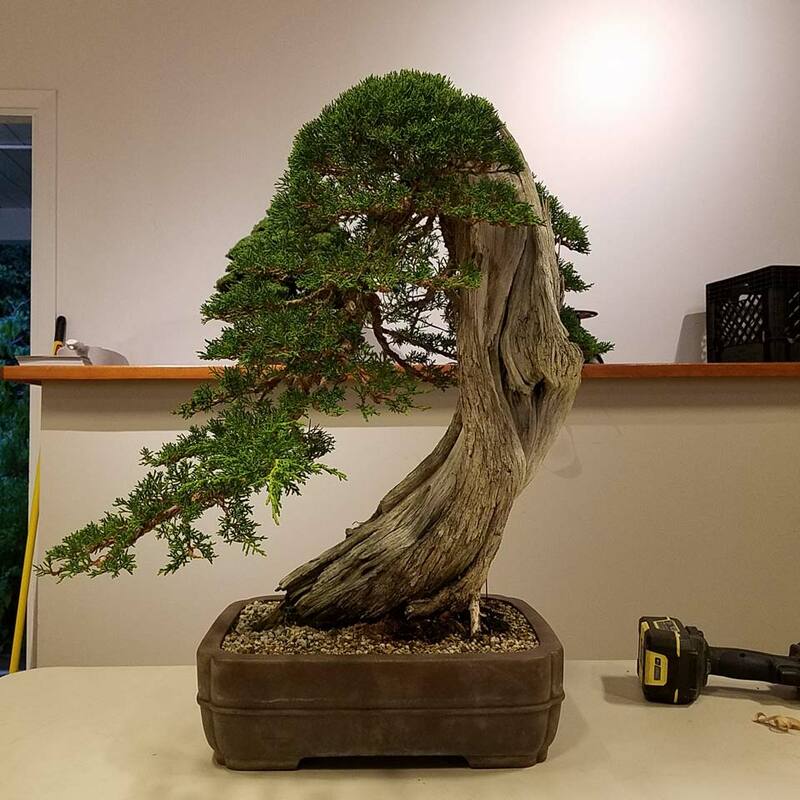 With little time left to actually work on it, he mostly had us look at the tree from different angles to envision the best front, focusing on how to best show the contrast between the live and the dead wood. Our next presentation from Peter Tea will be in October. See you there!